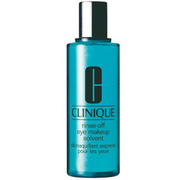 CLINIQUE rinse-off eye makeup solvent 125ml, an oil-free eye makeup remover that removes eye makeup quickly without rubbing. Perfect for touching up eye makeup, correcting mistakes or reapplication, the solvent dissolves without being harsh. The water-rinsable formula leaves no residue, and is easy to use without disturbing other makeup. Cleaner Type: Oil Free Eye Makeup Remover. Clinique Eye and Lip Care Rinse-Off Eye Makeup Solvent 125ml / 4.2 fl.oz. 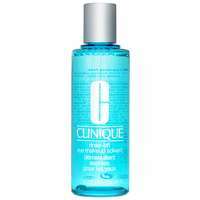 CLINIQUE rinse-off eye makeup solvent 125ml was found on 4 websites and was price compared using EAN: 0020714000318. The cheapest CLINIQUE rinse-off eye makeup solvent 125ml is shown as the main item, prices range from £13.95 to £18.00, excluding delivery. Price comparison based on price and delivery charges, with any valid discount codes being applied, is shown in the table above. Prices and information correct at the time of publication.